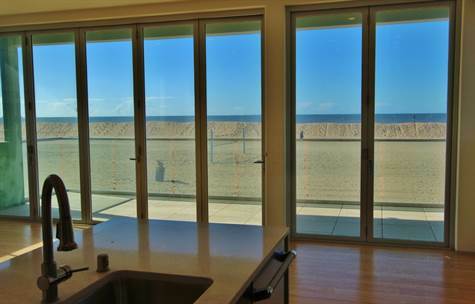 Newly remodeled contemporary 3Bd + 2 Bath on the sand. This second floor unit in a duplex has folding glass sliders that open to meet the fresh ocean air and your own private beachfront experience. Cook by it, dine by it, celebrate by it and drink it in. Luxurious scenic balcony, main living room with open kitchen and eat at bar. Enjoy extraordinary sunsets, whitewater views, and daily beach activities. This unit was recently remodeled from top to bottom. Special features include large screen TV, bamboo floors, high ceilings, two balconies, large laundry room, touch vanity lighting, heated towel rack, jetted tub, and versatile front bedroom/office with disappearing wall that allows in the oceans views. Generous storage plus private 1 car garage. Just blocks from area dining, shopping, and nightlife.. Easy access to LAX airport, Playa Vista, and South Bay.